Kaligarh (kā-li-garh) means artisan – someone specialised in a craft or art form, usually working by hand. In Nepali, this term captures a diverse range of skills: those of the jeweller, carpenter, tailor, mason or blacksmith. 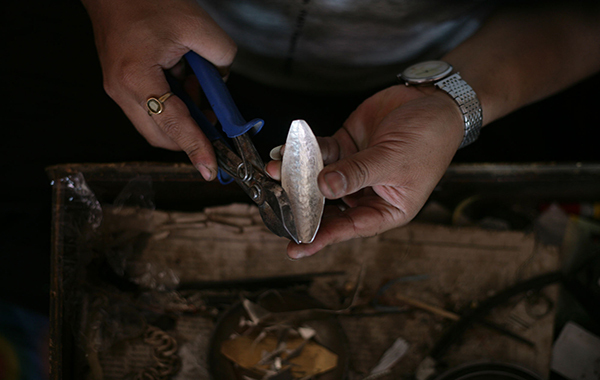 As a company, we pay tribute to the art and artisans of the Himalayan region, both ancient and contemporary. In our furniture and jewellery lines, we play with motifs and designs inherited from generations past, re-crafting them into new forms. Each Kaligarh product is handmade by small-scale artisans in Nepal and elsewhere in the Himalaya. The Himalaya is the greatest mountain range of all, spanning 2,400 kilometres from Bhutan to Afghanistan. It is a region of astonishing natural and cultural diversity, where the Tibetan Buddhism of the arid north meets the lush valleys and plains of the Hindu and Muslim lowlands. Before the modern age, artisans worked and travelled along routes crisscrossing these lands, creating distinctive indigenous forms of architecture, jewellery, textiles, furniture, paintings, sculpture, woodcarving and more. This is the Himalaya that inspires us at Kaligarh. The Valley of Kathmandu, particularly, has long been a hub of artistic activity. Its Newar culture, which reached its apogee in the 16th century, coalesced religious traditions and alchemized the artistic spirit of the mountains. It is here that Kaligarh was conceived, and today we work with craftsmen and women in bringing their creations to the wider world. We are acutely aware of the challenges faced by artisans who continue the traditions of their ancestors. Today, Kathmandu is the capital of Nepal and a bustling commercial city. Traditional artisanship is on the decline here and across the Himalayan region. The influx of low-cost foreign goods means that handmade items are only required for specific religious rituals. As a consequence, young people are not pursuing these arts, but are leaving – alongside skilled craftsmen – to pursue unskilled labour in the Gulf, often working under gruelling conditions, far from their families. “There’s no one to do this kind of fine work anymore” is a common refrain heard throughout the region. Through our jewellery lines, Kaligarh aims to promote the work of Himalayan artisans and in some way, help to revive fading artistic traditions. By working with artisans on a one-to-one basis, we aim to help them retain a positive sense of identity while enhancing their incomes. Ultimately, we seek to create opportunities in Nepal, so people don’t have to look for them elsewhere. Kaligarh was founded as a tribute to the artisans of the Himalayan region. Most small-scale artisans work independently, in their homes or in small workshops tucked away in the alleys of the old towns of the Kathmandu Valley. We go to great effort to identify artisans with whom we can work directly, and pay them premium rates. The artisan is at the centre of our company, and is treated with respect and dignity. With most of them caring for large, multi-generational families, urgent health and personal issues arise from time to time. In such cases, we support our artisans the best as we can, including through advances and flexible work schedules. Since the earthquake in 2015, we have provided interest-free loans to our artisans to rebuild their homes. 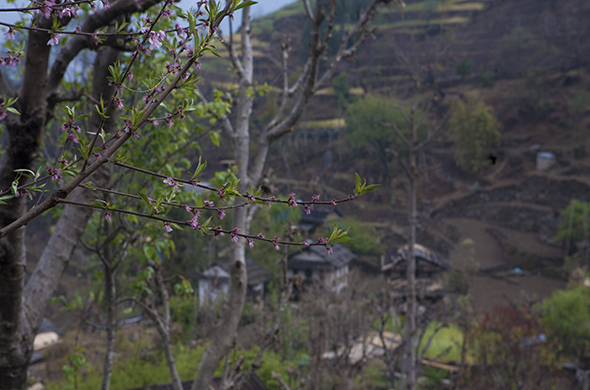 The communities of the Himalayan region are especially vulnerable to environmental change, including global warming. Thus sustainability is key to Kaligarh’s ethos and production strategy. For our packaging we use Nepali handmade paper, made from the bark of the lokta plant (pictured right), along with recycled card. In all operations, we are mindful to avoid the use of materials that are not recyclable or compostable. We believe in slow, sustainable fashion, and therefore focus on creating pieces that will last a lifetime.